A few weeks ago, I told you about TOLSTOY AND THE PURPLE CHAIR, a lovely book about books and their power to bring you back to life. This week I present another, different book about books. Enjoy! As I said above, this is a book about books. (Which also happens to be a quote from the first line of the introduction). 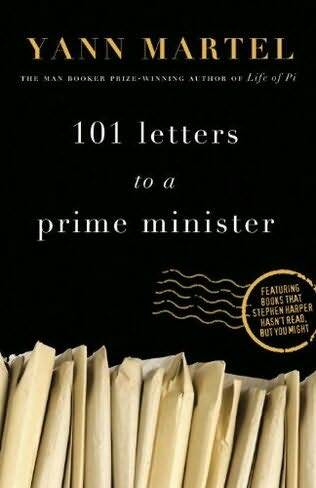 It is about a writer, Yann Martel, and the question that led him to write to our prime minister, Stephen Harper. The question was this: what is Stephen Harper reading? Which also begs the question, does he read at all? This, after all, is a man who has publicly stated that his favourite book is the Guinness Book of World Records. He is also a man who is running our country. I highly suggest you don't skip the introduction to this lovely book, which more clearly explains Yann's intentions, far better than I can here. The point is, he decided to send Stephen Harper a book with an accompanying letter explaining his choice, every two weeks. He never received a direct response for his efforts, but the gold mine of exquisite literature is something every person can enjoy. There are so many things I love about this book. First, there are the books themselves. What a treasure trove of excellent book recommendations! What avid reader wouldn't swoon with delight at the prospect of so many wonderful stories and poems? Second, of course, is the letters. If you didn't already know it, Yann Martel has a way with words. He effortlessly expresses sentiments I've never been able to fully define, delving into the beauty of the written word and the lessons within. His love for art seems boundless and his passion builds a fire in your chest, reminding you of every life changing word or work of art you've been witness to. He reminds us why books (and every other kind of art) is so important. He opens our eyes to our government and challenges us to question it, to really think about what we expect from our leaders. It reminds me of a retort I heard from a senator on Bill Maher's documentary, Religulous, in which he said, "you don't have to pass an IQ test to be in the senate." Hmmmm, but maybe you should? This is a book for writers. It is a book for readers. It is a book for the politically minded. It is a book about the beauty of books, and all they have to teach us.